Parts of Philadelphia are so blighted that there is really little hope for rebuilding. Those parts that are being rebuilt have become enclaves for the bourgeoisie and their re-gentrification projects. 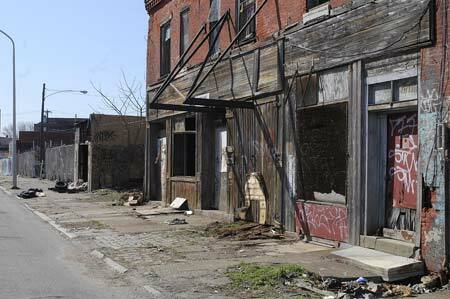 In Philadelphia blight is often just around the corner from affluence. The shift is dramatic and can best be illustrated on certain bus lines such as the 57 going from Penn’s Landing, through Northern Liberties, into North Philly. Some blocks of Philly are are just crumbling shells with just a few row homes suitable for habitation. I’ve passed by blocks where two row homes stood like broken teeth. Some neighborhoods can feel really heavy in their depressed state, forsaken by America. Sure, there are services, such as water and gas, and people can move through the city due to public transportation. But when the bus lines went on strike, I began to wonder about the vulnerability of the poor, disabled, and elderly. What happens if the state fails(I’m talking about the nation-state, not just Pennsylvania) collapses and society collapses? Sometimes I feel like we’re all in the midst of the apocalypse but are in denial. Maybe it is ending slowly, as we are losing our grasp on our humanity. It is not so farfetched, when you really think about it. As a child in of the 80s, I grew up under the threat of a nuclear holocaust. The idea of the world as we know it ending is part of our popular imagination. We have the upcoming Hughes Brothers’ film, the Book of Eli, 2012, I am Legend, Delicatessan, the Road, Mad Max, and countless other films and books. Some days, I think the end is near. The hints of social decay are all around us. There are parts of Philadelphia, Detroit, and West Oakland that remind me of the Terror Dome. A few weeks ago, I took a wrong turn leaving my school as I headed to the social security office. It finally dawned on me that I have been working in a North Philly post industrial wasteland. Within these streets, the border between the sociopathic and the plain ole ignorant seems to get really murky. Certain honor codes have gone by the wayside. Grown men in army uniform cuss out old ladies on the bus, women prostitute their children for a rock, and little girls get their faces blown off because they come from the wrong neighborhood. The level of violence reminds me that we don’t have to wait for the End of Days. I’ve prayed several janazahs at al-Aqsa where young Muslims lost their lives in senseless violence. Who needs fiction when you’re living your own apocalypse? I think our society, which once valued the untamed wilderness of the West, enjoys flirting with disaster. The urban apocalypse is our new frontier. Well this the way the world is. Allah never claimed the world is in a state of perfection. In the Qur’aan it repeatedly states amal as salihaat. To put things in proper perspective by performing proper actions. If the world was in proper state how can we put in in right perspective? All vice within the world is an nim’at from Allah and opportunity for Muslims. How we take advantage of it is another question. But one shouldn’t “hate the game” as they say. It is what it is. Sigh … you are correct. And there’s probably people chillin’ in places like the photograph in your post, the homeless, crackheads, runaways, etc. I was born in the Bronx, have lived in Harlem, Chicago, Pittsburgh, Houston, and a few other urban areas. I have NEVER seen what I have seen in Philly. The first time I saw Philly, I couldn’t believe I was still in Pennsylvania. The “problem” with Philly is that it has a lot of its own “special” laws that don’t affect the rest of the state. Plus, there is a lot of city government corruption. A lot of money has been poured into Philly and where has it gone? Our current governor, Rendell – well, Philly is his legacy as mayor, and look what he’s doing to the rest of the state as governor. We used to have those abandominiums in Harrisburg, but the mayor changed the laws and had most of them torn down. Even Pittsburgh doesn’t look as bad as Philly. They cleaned it up some, too, especially the downtown area. And don’t get me started about the young people in Philly. At the prison where I work, we have a juvenile unit for young ladies charged and sentenced as adults. I could tell you stories that would make your hair fall out. And I have to agree. The end is near. Nearer than the two lines between the Prophets (peace be upon him) forefinger and middlefinger. I am sure that the terror domes are not far off….scary the stuff that goes on in the world today. So true. Have you travelled through/to Camden, NJ yet Margari? I spend alot of time there (at the masjid or working in the university library, my husband also works in the school system) and you never get used to the amount of decay. That’s an amazing photo essay Samira. There is a major problem, easily solvable be a modification described in ‘T.E.A.F.S.” (Available at Amaon.com) Our machines & production systems are so efficent that we do not need everyone working. So give each person a fair share of our wealth of consumer goods. And retire older workers so young people can get jobs, taking them off the streets. Then no longer can recessions cause the suffering we are now experiencing.